Your generous love offerings to the church really make a difference, and they are tax deductible. Giving where you receive your spiritual food is a way to bring prosperity into your own life. If you think of other creative ways to help the church, we are open to new ideas. Please contact the main office at 707-542-7729. Below are some ways you can send a love offering spending no extra money than you would otherwise! Here is how you can send money to our PayPal account using your debit card or credit card. It’s quick and easy! Choose to donate any quantity. Tithing is tax deductible and we will send you an annual statement for tax purposes. Prosperity Banks: Every penny counts! Please bring your prosperity banks full of spare change on the first Sunday of each month. If you don’t have one, there are some in the the Social Hall. Look for little green boxes. Here are various ways you can do your normal shopping and Unity of Santa Rosa benefits. You pay no extra money! It is a win-win. Buy from your favorite online retailers using this link and a portion will come back to the church. Also make sure you have your Safeway Club Card, Macy’s charge card, and debit/credit cards linked to the church in your eScrip account. This will send the church money as you shop normally without you spending any extra. If you need help with this, contact the office at 542-7729. Paper form for Safeway, Macy’s, and any other credit cards. Hand it in to the Unity Office. Safeway, Macy’s, and others. You can also do this online without the form. Always start your Amazon shopping trip by clicking the link above or typing smile.amazon.com. After you choose Unity of Santa Rosa as your charity, a percentage of your purchases will automatically go to our church, even on subsequent shopping trips. 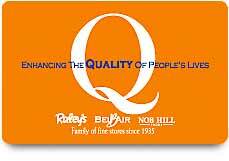 Use your Raley’s club card (Quality of Life Card) whenever you shop at any Raley’s store They will send us a percentage of whatever you spend there! Remember these are not charge cards–use the card if you are buying with cash, check, or credit card. We have the cards right here in the office if you still need one. Buy full value gift cards and the retailers send us a percentage. This option is a good one if you would like to buy gift cards to almost any major retailer to give as gifts or to use for your own use. All you do is buy gift cards through the church’s account and a portion goes to the church and you still get the full value of the gift card. Examples: Safeway gives us 4% of the gift card value, Shell 2.5%, L.L. Bean 17%, See’s Candy 23%, Peet’s Coffee 8%, etc. The full list can be found on www.ShopWithScrip.com. You do not have to order through the website if you would prefer to contact the office. Buy your spiritual books through Unity of Santa Rosa. Our bookstore is in the growing stages, but buying your class books here supports these programs and the church in general. Currently our selection includes great authors like Jeremy Taylor, Andrew Harvey, Michael Bernard Beckwith, Betty Bethards and more. If you do not see a title you are looking for, please ask us if it is something we can find for you. These books are incredibly beautiful children’s books. The church bookstore has a special account, so your purchase using this link will give to the church.